This nautical treasure welcomes visitors by sea or land. 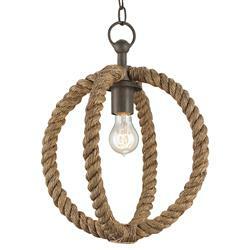 Natural abaca rope and wrought iron surround the single shining light. Coordinating antique rust chain allows adjustable heights for this seaside pendant.